Every year, goose farmers from across England gather together to celebrate their highly seasonal business and find out about best practice on other farms. In September 2017 they headed to Johnson & Swarbrick in Goosnargh near Preston, Lancashire, and ThePoultrySite was there to learn more. For over 30 years Reg Johnson and his step-brother Bud Swarbrick built a reputation for Goosnargh corn-fed ducks and chickens. They have supplied some of England’s top restaurateurs, including Michel Roux Junior, Marco Pierre White, Gordon Ramsey and Raymond Blanc. 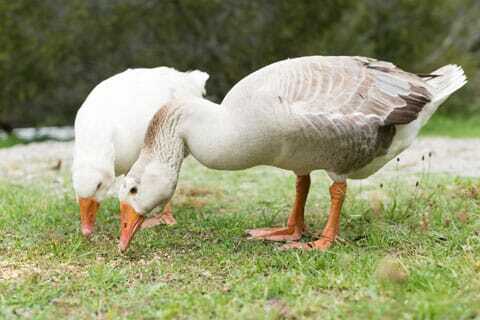 As recently as 2006 they branched out into rearing geese, with around 1000 birds coming to the market in 2017. Reg sadly died suddenly in November 2015, but the family business continues to perfect and expand on his innovations, including an on-site feed mill and feather processing plant. Farm-reared rather than organic, Goosnargh birds are known for their quality and flavour, grown long and slow for taste and texture. Here producers, vets and press gather in Johnson & Swarbrick’s barn ahead of a walking tour of the farm operations. It’s an invaluable opportunity to share knowledge and ideas around production and promotion, and to assess challenges of environment, labour supply and more. "Migrant labour makes up more than 60 per cent of those employed in the poultry meat industry," said Shraddha Kaul, public affairs manager of British Poultry Council. "As an organisation, we are lobbying to clarify and protect the rights of these workers who play an important role in the productivity and efficiency of the industry. It will be quite a challenge for the future." Never averse to experimentation, Johnson & Swarbrick have invested in making the entirety of their operation more efficient. They have planted around 40 acres of miscanthus or elephant grass, which is used for a biomass boiler that provides most of the heat needed for the young chicks, ducklings and goslings. The crop is gathered using a forage harvester and stored in a vast white ‘ag bag’, known on-site as ‘the sausage’. This method is more efficient than baling, and in 2017/18 they aim to use only miscanthus for their bedding needs as well. Here Bud holds up some bedding being used for week-old chicks. The farm can process around 1,100 birds a day on each of its two killing lines, with around six staff to a line. The birds are slaughtered in the afternoon and then hung overnight to add to the flavour, before being dry plucked and then waxed (ducks and geese only – chicken and turkeys have more delicate skin that would rip, so are wet plucked). The wax process is quite unusual outside large commercial operations, and some of the machinery had to be custom-designed to fit the smaller space. The wax is delivered in blocks and melted to make a hot bath, which strips the last of the feathers and conditions the birds’ skin. It can be re-used once or twice before it is recycled. Compared to hot plucking to remove the last feathers, the waxing process leaves the bird with a better skin quality and longer shelf life. Around three years ago the farm bought a second hand feather processing system and installed it themselves. 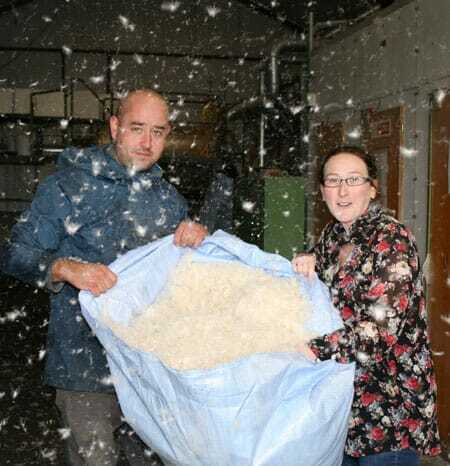 Instead of wasting the duck and goose feathers, they now produce around 30 tons per year of duck and five tons of goose feather for the feather bedding market every year, mostly supplying factories in the UK and EU. Each load of approximately 70-80 kilos of feathers goes through a 25 minutes chemical wash, then a centrifuge drier, then a sterilising drier. The final cooling box separates the down from waste wing and tail feather, which can then be used as sterile bedding. The farm doesn’t produce enough feathers themselves to keep the machine running, so purchase feathers from other duck and goose farms (as long as they are dry plucked which gives a more robust feather). It’s an exciting extension to their main business – although they have seen feather prices fall 60 per cent since they made the investment in the plant. L-R: Adam Swarbrick, Kara Johnson and Bud Swarbrick. Founder Reg Johnson, Kara’s father, died suddenly in 2015. 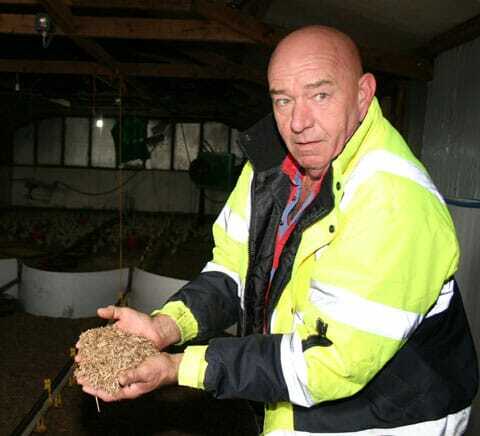 The Johnson & Swarbrick operation stands out for its innovation and investment in a holistic operation, including mixing the birds’ feed on-site. 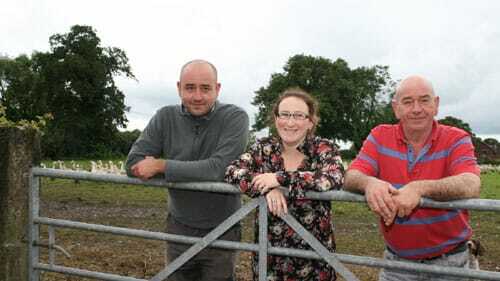 Touring the farm you get a strong sense of the family working together in the best interests of the product, determined to maintain the standard that has made the Goosnargh name one to conjure with among UK restaurants.